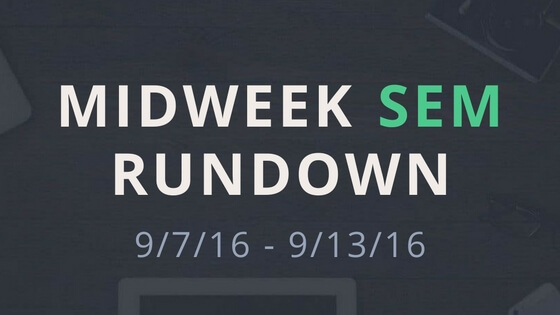 Welcome to the Weekly SEM Rundown, where I recap the past week’s major SEM news and provide insights. Prepare for AMP results in the 10 blue links. Back in late July, Google provided a preview of the future of AMP – its placement in the 10 blue links (in mobile search). Google plans to expand AMP results into the main mobile search results. Users who click on an AMP result will be brought into the AMP viewer. The viewer allows users to swipe through the stories in the search results without having to return to the main search results view. Think of it as a Tinder experience for content. This will dramatically change the search experience. Webmasters need to have a plan to make their sites AMP friendly for search engines and visually appealing in AMP format for users. Google has really been pushing AMP, let’s hope they don’t bail on it. Google preparing Penguin 3.0 announcement. During a hangout, John Mueller said Google is working on an announcement for Penguin 3.0. Some assume that this means that the release of Penguin is finally drawing near. If you are working on backlink cleanup, you may want to hurry to finish up. Of course, we could just end up waiting another six months again. European court rules, linking to illegal/unauthorized content is copyright infringement. The Court of Justice of the European Union (CJEU) ruled that “every act of communication of a [copyrighted] work to the public has to be authorized by the copyright holder”. In the case, a webmaster was repeatedly linking to illegal content, despite protests of the copyright owner. However, the general ruling can later be applied by other courts in a way that threatens the open information flow of the internet. Search engines may be imposed with a significant burden to determine if the sites presented in their results contain unauthorized content. This burden may also be placed on webmasters whenever they link out to another website. Google reminding webmasters not to use widget links as a link building strategy. Google posted an article on their blog, reminding webmasters to not insert links in their widgets as a link building strategy. The strategy used to be very popular and involved developers placing hidden links in their widget code. When a webmaster used the widget on their site a low-quality link pointed back to the developer’s site. This tactic has been considered grey (if not black) hat for a couple of years now. Webmasters with these links on their site or developer’s with these links in their backlink profile may start receiving notices and manual penalties in their Google Search Console accounts. Google says AMP pages provide expanded exposure in mobile search. In Google’s recent blog post about AMP, included is the line “all types of sites that create AMP pages will have expanded exposure across the entire Google Mobile Search results page”. This line has caught the attention of the search industry. When it comes to the future of AMP it looks like Google is not bluffing. If you have an “e-commerce, entertainment, travel, recipe sites” or essentially any topic based site, look into how AMP can be added to your site. Increase in Google Search Console Crawl Errors not an issue. Webmaster have recently been noticing a larger number of crawl errors showing up in their Google Search Console accounts. John Mueller was asked about the issue during a Google Hangout. He responded that the uptick in crawl errors was not due to the recent algorithm update. Instead, Google had been crawling and updating information on a lot of older URLs, which are often removed. This explains the surge in crawl errors. Google Analytics Real Time report down. 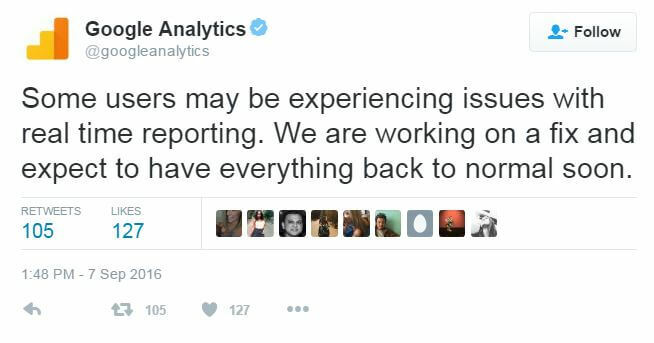 A number of webmasters were complaining that the Real Time report within Google Analytics was not working. Instead the report was displaying a line of text, “resource is not available, please try again later”. Google has been working on correcting the problem for a few days now and the issue should be fixed soon. Google did offer a temporary work-around: clear your cookies from your browser and use Google Analytics in incognito mode. Check page quality if rich snippets not present in search results. When you add schema markup to your website, you first need to test it is written correctly in Google’s structured data testing tool. If it is written correctly and doesn’t break any of Google’s policies, it should display in search results. However, if your page is low quality, the featured snippets may still not show up. To test if the page quality is the issue, John Mueller recommended doing a site query for your site. If the rich snippets do not show up in the direct site query (Site Command), this indicates an issue with the quality of the page. New query modifier in Google featured snippets. 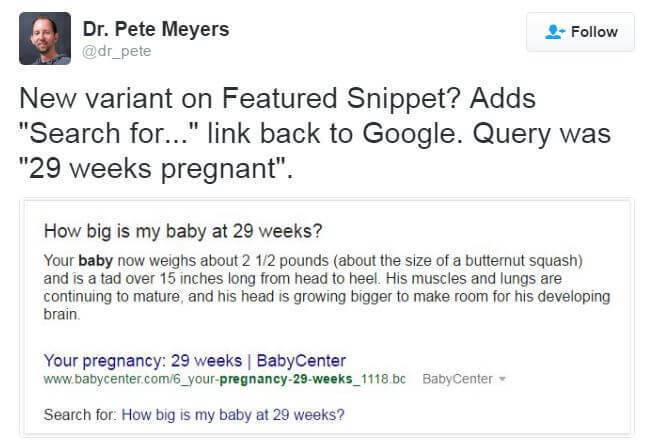 Pete Meyers tweeted a screenshot of an added query modifier that appeared in the featured snippet answer box. At the bottom of the box was the text ‘Search for’ followed by a modified query. Clicking on the query updates the search results and answer box. Code to text ratio is not a Google ranking factor. John Mueller succinctly answered ‘no’ when asked if code to text ratio is a ranking factor for Google search. Many SEO tools include a code to text ratio analysis. You can now safely ignore it. However, sloppy code with unnecessary calls can affect site speed. Don’t let your developer grow lazy. Bing improves autocomplete for academic and movie search. Bing launched its new autocomplete features earlier this year, but only recently announced the improvements. Academic-related searches allow users to explore the relationships between papers, authors, topic and publications in a large object graph. Movie related searches are analyzed for natural language input and determination is made of the most likely interpretations. The new autocomplete can also generate extensions for queries never previously searched. The old autocomplete relied on adding extensions for queries that Bing had previously seen. Google testing bolder, darker AMP icon in search results. Google is running a test with a darker and bolder AMP symbol displayed next to AMP results in the SERP. This variation calls more attention to the AMP results than the light, greyed-out version they currently use. Search Engine Strategies (SES) is shutting down. Search Engine Strategies, founded by Danny Sullivan, was among the first search conferences, starting all the way back in 1999. Over the years it slowly faded as other conferences began to emerge and especially when Danny Sullivan left and started up Search Engine Land and Search Marketing Expo. Seeing the conference disappear is reminiscent of Yahoo shutting down its directory. Google Search Console Search Analytics being fixed. Last week, a bug in the search analytics section of Google Search Console caused data to stop updating. Understandably, a large number of webmasters were annoyed. John Mueller tweeted last Thursday that the report had a delay but should be catching up. Security Issues report improved in the Google Search Console. Google announced an improved version of their Security Issues report. The updated report includes more specific explanations, with context and detail, of security issues detected by Safe Browsing. Issues that are reported include malware, deceptive pages, harmful downloads and uncommon downloads. Google reaches 1.75 Billion sites deindexed due to copyright infringement. Google has reached 1.75 billion confirmed websites, deindexed due to copyright infringement. Google generally accepts copyright takedown requests and has only rejected 39 million (2 percent of total requests). Google does not identify copyrighted material on its own. It requires the copyright owner to submit a takedown request. If you are dealing with others using your content, first make sure you have canonical tags setup correctly on all content on your site. Then, submit offenders to Google. Google removes detailed Keyword Planner data for all non-advertisers. A few months ago, Google had limited the data presented in the Keyword Planner to those with an active account. All others were only presented with broad traffic estimates for keyword searches. Google has since expanded the limitation to all non-advertisers and now to all legacy accounts. Google has also added an undisclosed spend threshold as a requirement to prevent users from spending just $1.00 to see the keyword data. Other similar loopholes have been closed off. Google now expects you to pay for access to keyword data. Adwords Campaign Experiments to be replaced by Drafts & Experiments. Google will be replacing its Campaign Experiments with the new Draft & Experiments which launched back in February and was extended to display campaigns in August. Drafts allow you to make multiple edits to a campaign without the edits going live until they are posted. Beginning the week of Oct 17, advertisers will no longer be able to create new Campaign Experiments and the platform will be completely finished on February 1, 2017. Google extends Expanded Text Ad deadline to January 31, 2017. Google will continue to accept traditional text ads until January 31, 2017. The original deadline was October 26. After the January deadline, existing standard text ads will continue to run, but advertisers will not be able to edit them or create additional standard text ads. In its announcement, Google also listed a suggest set of best practices for testing expanded text ads. Multiple account access & management in Google Adwords. A new feature has been added to Google Adwords, which allows users to sign in with one account and switch between other accounts without using My Client Center. Up to 5 Adwords accounts (including manager accounts) can be associated with a single email address. You can also invite additional users to access your account with a single click. No more email verification required. Google Keyword Planner altering keyword queries. The Keyword Planner has begun altering keyword queries, showing what appears to be the most searched for variant. If you place the word “dealership” into the tool, you will receive keyword data for the term “dealers”. This behavior is not very reliable and sometimes shows alternate keywords which change the intent of the search. The Keyword Planner seems to be less reliable than ever. Error in Google Keyword Planner. A number of people are complaining on Twitter that the Keyword Planner in Adwords is not working. When they try to access the tool they receive the message, “to use Keyword Planner, you need to have at least one active campaign. If you have an active campaign and are still seeing this message, try reloading Keyword Planner in a few minutes.” Google has responded to these complaints, saying they are working on the issue. Google alerts users to combined data in Keyword Planner. Google updated its Adwords Keyword Planner to be more transparent when it is displaying search volume estimates for combined search variants. Google started combining variant data earlier this year, but it was unclear when it was happening. Now, when combination happens the data is displayed on a single line and a notification appears on the top of the page. 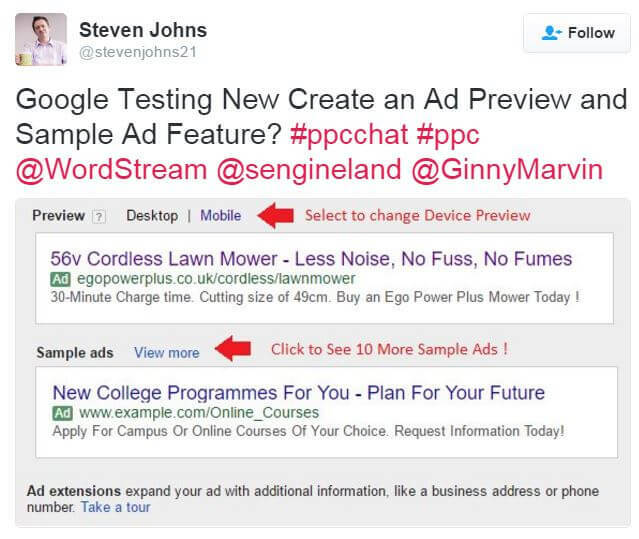 Adwords ad preview now includes expanded text ads. Google updated the ad preview in Adwords to include expanded text ads. This should help advertisers have a better idea if their headline might be truncated. The updated ad preview has separate mobile and desktop views and a separate section to view sample ads. The ‘view more’ link brings up a window with more examples of expanded text ads. Google rolls out Adwords Shopping Tab Results in ten countries. Product listings in the Adwords Shopping Tab, specific to their host country, wer initially limited to: United States, United Kingdom, Australia, Germany, France, japan, Italy, the Netherlands, Brazil, Spain Switzerland and the Czech Republic. Google recently added the following countries to the list: Austria, Belgium, Canada, Denmark, Mexico, Norway, Poland, Russia, Sweden and Turkey. These new countries previously showed country specific products in search results and in Google Partner search results, but not as a standalone shopping tab. Google’s help documents have been updated to reflect the change. Google making adjustments to ads in Play Store search results. Google is updating how app promotion ads display in the Play Store. A second ad slot will be available on some non-branded, broad queries. A second ad will not always display for these queries though. Also, when users search for a specific app they will no longer receive an ad for the app above the app itself. Instead the app will be top result, followed by related apps and ads for related apps. This will help prevent advertisers from paying for clicks from users who were going to their app anyway. ‘Reviews from the web’ now on Local Knowledge Panels. Yelp removed from ‘Reviews from the web’ section of Local Knowledge Panel. After being displayed for a short period for of time, the reviews from Yelp have been removed from the Reviews from the web section of the Local Knowledge Panel. It appears this removal was at the request of Yelp. Other sites like 4Square and Zomato have filled Yelp’s place in the section. Google updates its schema review guidelines. The new guidelines split the old version into two sets of rules, covering critic reviews and review snippets. The updated critic reviews guidelines make it clear that reviews must be written by a human and not be machine generated. Additional guidance was also provided for the use of Review Snippets. The most important note regarding Review snippets is that businesses are still restricted to only adding schema markup to reviews generated on their own site (and not from third-party websites). Potential refresh to Google local ranking filter. It appears that Google is running a local filter that cycles in a period of weeks or months (rather than continuously). The filter scans the listings appearing in the 3-pack or in the Local Finder (viewed when you click “More Places”) and removes any that are marked with a spam score beyond a certain threshold. This cyclical filter may be to blame for the shrinking of local listing results back in July. What gets tagged by the filter seems to vary widely by search industry. Google Maps hiding addresses from listings. Google used to display the addresses of listing underneath their name in the left hand bar of Google Maps. They now hide the exact addresses from the user. The addresses still do display in the local 3-pack and in Maps if the user clicks through from the local 3-pack. “Helpful” button being tested in Google Reviews. 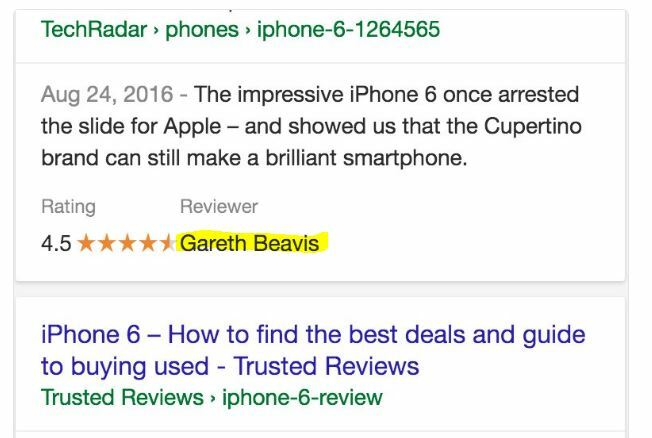 Google is testing a small thumbs-up icon next to the word “Helpful” underneath reviews. Clicking on the button allows users to rate reviews. Google adding reviewers name in rich snippets. Google has added the name of the reviewer to the rich snippets displayed in the search results. The name of the reviewer only appears when there is a single review available. Google adds pricing information to displayed mobile rich snippets. Google updated its mobile organic review rich snippets. The snippets now have additional space and display pricing details. Stay informed of the latest search engine optimization, pay-per-click advertising and local search news. Get the major SEM news of the past week straight to your inbox.